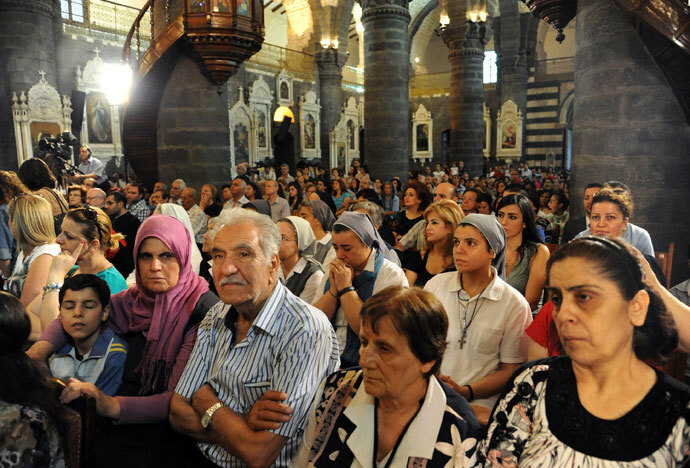 DAMASCUS — Syrian Christians offered prayers Sunday for a group of more than a dozen nuns and orphanage workers held by rebels for nearly a week, fueling fears in the minority community that they are being targeted by extremists among the fighters seeking to oust President Bashar Assad. The seizure of the 12 Greek Orthodox nuns and at least three other women is the latest attack to spark panic among Syria’s Christians over the strength of al-Qaida-linked militants and other Islamic radicals in the nearly 3-year-old revolt against Assad’s government. A priest and two bishops previously kidnapped by rebels remain missing, and extremists are accused of vandalizing churches in areas they have captured. Rebels seized the nuns on Monday from the Greek Orthodox Mar Takla convent when fighters overran Maaloula, a mainly Christian village north of Damascus that lies on a key highway and has changed hands several times in fierce fighting between rebels and government forces. The group, along with three women — themselves orphans — who work in the convent’s orphanage were taken to the nearby rebel-held town of Yabroud. The eldest of the nuns is nearly 90 years old, and the youngest of the orphanage workers is in her mid-teens, according to Mother Superior Febronia Nabhan, head of the Saidnaya Convent. On Friday, a video was released of the nuns, in which they denied being kidnapped, saying they were in good health and that fighters had taken them to a location away from the combat out of concerns for their safety. The video only stoked the worries of Christians who gathered Sunday for a Mass at the Mariamiya Church in Damascus, the main Greek Orthodox church in the country. “It’s been a week. If they’re only holding them for their safety, they could have handed them over by now,” she said, speaking on condition of anonymity for fear of retaliation against herself or her family. Christians and other minorities tend to support the government of Assad, who comes from a Shiite offshoot sect. Syria’s Sunni Muslim majority form the backbone of the uprising against Assad. But nationalist fighters among them have been overshadowed by the increasing power of extremists, including Syrian rebels who have taken up hard-line al-Qaida-style ideologies and foreign fighters. He carefully avoided describing the nuns as “kidnapped” or asking for their release — praying only for their “return” — a sign of concerns among Church officials that any statements could enflame the situation. The rebel faction that released the video, aired on Al-Jazeera television, did not identify itself, and no faction has announced it is holding the group. Syrian opposition activists and Church officials have said the al-Qaida-linked group Jabhat al-Nusra, or the Nusra Front, is holding them. One activist said a Syrian Christian businessman is trying to mediate between the Nusra Front and the government for their release in return for the release of seven Saudi fighters. The activist spoke on condition of anonymity to discuss the secret mediation, but did not have further details. Greek Orthodox Church officials would not comment.